Why Is All This of Interest? The idea behind these updates is to help users understand how some things in Second Life can impact your viewer performance. In this case: your LOD Factor setting. Very simply put: some mesh content in Second Life is made with only two version: a very high detail model, and a very low detail model – and there can be valid reasons for this (e.g. furnishing and indoor objects which are never seen from more than a few metres away, and so their detailed version is rendered). However, it does mean objects can “collapse” very quickly with only minimal camming away from them. 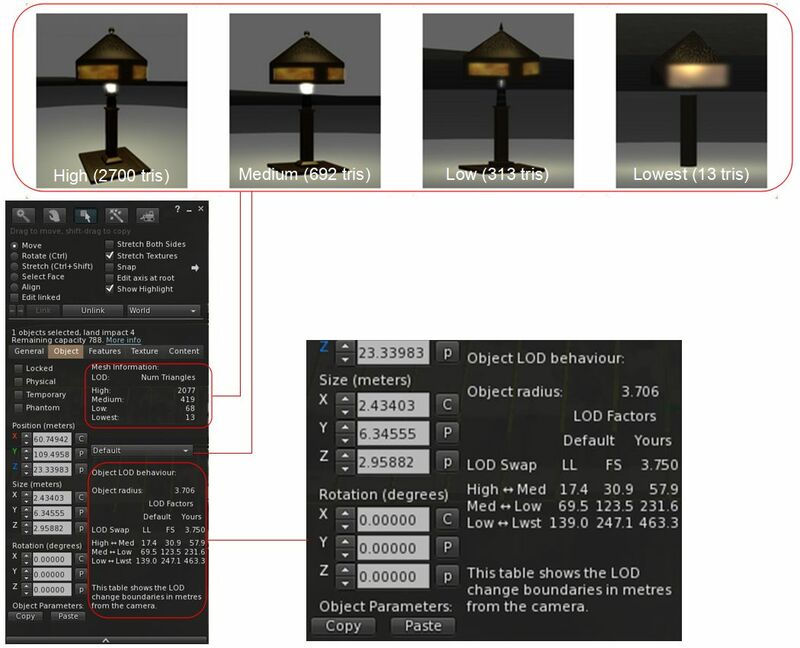 To compensate for this, some content creators advise purchasers to increase their viewer’s LOD Factor to values such as 10, 12, 14 or more, using the RenderVolumeLODFactor Debug setting. However, LOD Factor is a global setting, affecting everything in your field of view not just the object in question. Therefore, increasing it just to see one object can actually force many of the objects you can see to render using their more detailed LOD models, whether or not they are actually needed. This increases the overall rendering load, reduces FPS, and generally pulls down your experience. By providing this render information, Firestorm hope users will be able to make better judgement calls on their viewer settings to assist in better performance, and have a better understanding of “good” and “bad” content. Note this does not present the debug from being set higher than 4.00, but do take note of the recommendations in the pop-up. Particularly the second item: any setting above 4.00 will only persist for the current log-in session. When you next log-in to Second Life, it will be reset to the Firestorm default of 2.00. Faces: Number of texture faces. Vertices: Number of vertices that make up the object. Triangles: Number of triangles that make up the object mesh. TMem: Texture memory used by the object. VRAM: Video RAM used by the object. Folder sub-folder and item count: left-clicking on a folder in Inventory (any panel or tab) will now display the total number of items in the folder, and the number of sub-folders it contains in the format (items / sub-folders). So, (212/53) indicates a folder has 212 items in 53 sub-folders. Deletion Warning Notification: a warning is now displayed when attempting to delete a folder which has contents hidden (e.g. because a search filter is active). Recent Tab > Show In Main View: right-click on an item in your Recent tab and select Show In Main View” to switch to the Inventory tab with the item highlighted (FIRE-14599). Inventory item count: now includes folders, as per a Linden Lab update. Chat Windows: reports of ignored conference chats in nearby chat now includes a URI link to the inviter when Automatically Ignore And Leave All Conference (Ad-Hoc) Chats and Report Ignored Conference Chats In Nearby Chat are both enabled. New command Lines (via chat): /zoffset_up: Offset your avatar upward by 0.05; /zoffset_down: Offset your avatar downward by 0.05. General: new option to show/hide invitations to already joined groups. Log & Transcripts: Use Built-In Transcript Viewer should now be correctly disabled when unchecked. 2D Overlay > Remap shortcuts: remaps short cut already used by Linux (Ctrl-Alt-Fn) to use Ctrl-Shift instead (Linux Only) – FIRE-21625. Font: Celestia medium redux font added. This does not support bold or italics. Move & View > View: Added option to disable visual hints when editing shape. Reset Mesh LOD (experimental): if your mesh clothing fail to render correctly after camming and hitting ESC, this should correct the problem. Avatar Context menu: Reset Mesh LOD; pie menu: Appearance > Reset > Mesh LOD. Experimental fix for imposter avatar animations playing at the wrong speed. Hover Height: should no longer reset on login or teleporting under certain conditions (FIRE-21489). Area Search: search terms should no longer persist across instances (FIRE-21396). Vignette settings now saved as a graphics preset (FIRE-21617). Grid Status: Help > Check Grid Status and Grid Status toolbar button now obeying the browser setting (FIRE-21236). Animation uploads: Frame loop slider can extend past 100 frames (FIRE-21330). Broken rigging to attachment points: the debug setting FSEnableRiggingToAttachmentSpots must be set to TRUE when uploading mesh rigged to attachment points (FIRE-21000). Please refer to the release notes for the complete set of updates, fixes and contributions. Mesh Rendering – FSEnforceStrictObjectCheck:As a rule of thumb, mesh objects should never be uploaded to OpenSim using “Analyse”. With Firestorm 5.0.11, any mesh objects which are uploaded with Analyse will likely render as invisible if the Debug FSEnforceStrictObjectCheck is set to True. To avoid this, set FSEnforceStrictObjectCheck to FALSE. Gloebit currency support: see About Gloebit (FIRE-21587). More OpenSim OSSL functions added to the script library – see the release notes for a full list (FIRE-21301). Inventory should now load correctly on OpenSim (FIRE-21376). SL Grid Status tool should not longer be active on OpenSim. Firestorm 5.0.11.5364 offers a lot of food for thought around LOD and mesh, and a good read of Beq’s blogs, as linked to in the text above is recommended. Even though this version isn’t built using the Alex Ivy code, I have – in the 48 hours I’ve been using it – noted something of an uptick in frame rates and general performance, although texture rezzing in busy regions can still be a pain (which I put down to more local problems (I did not do a clean install) and possibly my CDN connection. This is great info, thank you for the breakdown. Only thing I’m noticing is that the login screen on the latest FS Viewer is a stark blank white – no ‘firestorm’ logo, no in-world population numbers – just a blank white screen. Everything else seems to be working great though so that’s not really a major issue. I’ve literally just had that happen to me – I suspect it might be because right now, the FS servers are getting somewhat hammered with download requests, and this could be pulling down delivery of the splash screen into. most likely its because a fresh install cleared your cache file so relogging restored any images you are used to seeing on login. it didn’t happen for me because i didn’t do a fresh install; i just installed the new fs over the old and kept my old config files..but i use linux viewer. Yup… the contribution was from Kitty :). I leave the full credits for contributions to the official release notes, as listing them in a review can made for repetitive reading 🙂 . Inara… in the articke you note that the Firestorm “default LOD Factor (4.000)”. It is in fact 2.0. It is. Brain fart on my part while doing a complete last-minute re-write of that section in the last 20 minutes before the release is due to be pushed out (original version was FAR too wordy). Thanks for spotting it! Thank you so much for taking the time to break everything down! It’s was very helpful and cleared up some confusion! Much appreciated! Many changes in this required Firestorm Viewer update! Is the inventory count done differently now? It was 16,890 before and now 20,886 after the new installation. There’s no reason the count should have changed, as far as I’m aware. Folders are included in the total items count now. This is a change also being done by Linden Lab in the next maintenance release (if it’s not happened already). In the same paragraph you highlighted about the numbers on folders Inara, you didn’t include why the count will be higher in the Inventory. I am pasting what was said on the release notes on the Firestorm blog post. I think that may have gone into the release notes after the release went live (and so I didn’t catch it in the release notes to record the change), or was a last minutes addition which I missed in order to have the post available when the release went live, either way article note updated.